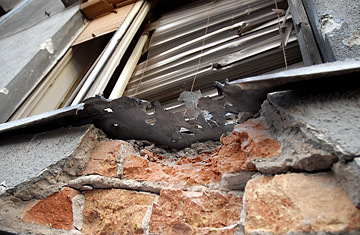 A broken window and structural damage were the result of a grenade attack on TIME magazine contributor Dejan Anastasijevic's home. It was just before 3. a.m. on Saturday when a hand grenade went off outside the bedroom window of my Belgrade apartment, filling the room with smoke and shards of glass, leaving shrapnel holes on the ceiling and walls  some only inches above the bed. Despite the damage, we were lucky: When the police arrived, they found a second grenade, unexploded, on the sidewalk nearby. I had been in danger many times before while covering the bloody breakup of the former Yugoslavia for TIME and for the local newsmagazine Vreme. But this was different: The wars ended years ago, Slobodan Milosevic is dead and buried, and this was not a combat zone; it was my own apartment in my own hometown. And for the first time, my wife was also a target  fortunately, our teenage daughter wasn't home at the time. Four days later, police have no clues to the identity of our attacker, and neither do I. But I have a pretty good idea what triggered the attack. Last week I was a guest on a local television show discussing a topic many of my fellow Serbs would prefer to forget: The 1995 massacre of some 8,000 Bosnian Muslims by Serbian troops led by General Ratko Mladic, who is still on the run from international justice. The TV debate centered on the April 11 verdict by a Serbian war crimes court that sentenced four members of a paramilitary group known as the Scorpions to a total of 58 years in prison for the execution of six Muslims from Srebrenica. The trial was considered a test case for the Serbian justice system, since it was the first time ever that crimes related to the "ethnic cleansing" campaign in Bosnia had been tried on home soil. And the evidence was incontrovertible: a video of the killings recorded by a member of the Scorpions and shared with his comrades as a macabre souvenir. When it was played at Milosevic's trial in the Hague, several Scorpions were immediately arrested, amid a wave of revulsion across the Balkans, where it was shown on most TV stations. The tape showed six handcuffed victims  two were just 17  taunted and mocked by laughing executioners. The victims, aware that they were about to die, asked for water, and were refused. At one point, one of the Scorpions asks a tied-up Muslim boy, who lies face down waiting to be shot: "Have you ever f---ed?" The boy answers no. "Well, you're not going to, ever," replies the soldier, and all his comrades laugh. Considering the tape, forensic evidence and the full confession of one of the accused, harsh sentences had been expected. The commander of the group and one other received the maximum penalty, 20 years, while the Scorpion who had confessed got 13 years. The man seen on tape mocking the boy got only five years, however, because the court found that he didn't actually pull the trigger on the captives, but had only escorted them to the execution site. A fifth Scorpion was acquitted because the court concluded he had left the scene prior to the killing. The most disappointing thing about the verdict was the efforts of the judge, Gordana Bozilovic-Petrovic, to absolve the Serbian government, and even, to some extent, the accused, whom she described as "family men, with no prior criminal record, who were in no way responsible for starting the war." She described the Scorpions as an "irregular volunteer unit" and insisted they had no relationship with any branch of government in Serbia, despite ample evidence that they had been an integral part of Milosevic's security forces. And as a final insult to the relatives of the victims, she said there was no evidence that the deceased were indeed from Srebrenica or victims of the genocide. Like many decent people in Serbia, I was disappointed and somewhat angered by the outcome of the trial, and I expressed those views on television. I guess that provoked someone in the other camp  the many who refuse to believe that the genocide in Srebrenica happened, or worse, those who believe it was a good thing  enough to find out where I live and place those grenades on my window sill. This didn't require a lot of courage or expertise: we live on the ground floor, and hand grenades are both user-friendly and easily available on black market. So it could have been anyone. I now have police watching my home 24/7. The attack was a sharp reminder that more than six years after Milosevic's fall, Serbia is becoming increasingly violent, and virulent nationalism is on the rise again. There have been 111 politically motivated assaults in the past three months, alone, and hate speech is becoming increasingly common in the media and politics. The targets are human-rights activists, journalists and politicians who dare to stand up against the nationalists. One reason for the nationalist revival is the push by the U.N. toward independence for Kosovo, a province mostly populated by ethnic Albanians, but cherished as an historic heartland by most Serbs. It may also be a symptom of the fact that three months after the parliamentary elections in which ultranationalists won almost a third of the vote, Serbia still has no government because the moderates can't agree on power-sharing. Or maybe the fact that six years of democracy has failed to bring economic prosperity, so people are growing nostalgic for bad old days. I'll leave it to political scientists to look for the explanation. I don't take the attack personally. Its target was really that part of Serbian society that believes we cannot move forward until we have honestly confronted our recent past  even the very notion of a Serbian democracy in which bullets and grenades are not tools of political debate. And, judging by the response of the authorities, something positive may yet come out of the whole ordeal. Within hours, the Director of Serbian police showed up personally to tell me that finding the attacker is being given utmost priority; soon after, President Boris Tadic also came over to express his support. Rade Bulatovic, the head of Serbia's main security agency, whom I had often criticized in my reports, called by phone and offered help; even now, my phone is ringing off the hook with expressions of outrage and offers of help from judges, lawyers, politicians, diplomats, colleagues and ordinary Joes. And to my absolute amazement, on Monday at noon, liberal politicians and human rights activists blocked the traffic for five minutes in all the major towns and cities in Serbia as a symbolic gesture against the attack. So, the grenades on my window sill have served as a wake-up call to all of Serbia to renounce violence and stop its slide towards the ugly past. Maybe this time, it will stay awake.